The big stock photo agencies aren’t exactly well known for their supportive and caring relationships with photographers. They add professional insult to financial injury when they allow their clients to avoid acknowledging their photographers via picture credits. Most major news outlets, whether print or online, have turned to stock photo agencies to supply images. These days there are more pictures credited to Getty, or Alamy, or AP, or Reuters than to the fast-disappearing in-house photographer. Just this week Media Watch reported that six staff photographers’ jobs at The Border Mail will be cut, with Fairfax hinting at many more to come from various regional Victorian mastheads. But surely signing up to work for Getty et al shouldn’t mean compulsory anonymity. In many cases, the publication is in fact breaching the terms it agrees to when licensing an image. Section 4.3 of Getty’s Terms and Conditions states that all licensed editorial material ‘must include the following credit line adjacent to the Licensed Material: ‘[Photographer’s Name]/[Collection Name]/Getty Images’ – or as otherwise shown on the Getty Images website. Chosen at random (and certainly not exclusive to Fairfax), a quick browse through the Sydney Morning Herald’s sport section will show most images credited to Getty Images, with no indication that an actual living, breathing (starving) photographer took the shot. The photo in this screenshot was taken by Getty Images, or so you’d think. The only case where the publisher is not in breach, according to the terms and conditions, is if it’s ‘otherwise shown on the Getty Images website’ – that is, if the image was supplied to Getty by a corporation or the like. For instance if Apple supplied Getty with product shots of the latest iPad. 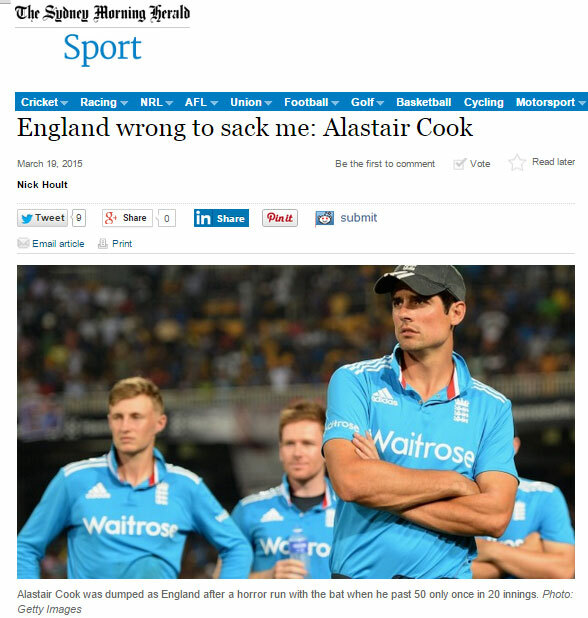 So if we take as an example an image in the SMH of English cricketer Alistair Cook, and conduct a reverse Google image search – a technique commonly used to track down copyright infringement – it yields many more examples where the photo has been run in publications without crediting the photographer – but always crediting Getty. It wasn’t hard to find the image using the Getty search engine. It was on the first page (apparently photo editors aren’t very picky these days! ), and Getty had it credited, twice, to Gareth Copley. Copley, a UK-based Getty sport photographer told Pro Counter that it doesn’t bother him. ‘It’s nice to have your name credited, but I’m not put out if the publication just credits the agency. It’s more important to me that they are using the picture in the first place,’ he said. Regardless, it appears Fairfax has broken the T&Cs, and consequently ‘an additional fee in an amount up to one hundred percent of the Licence Fee may be payable by Licensee, at Getty Images’ sole discretion’. In other words, it’s up to Getty to pursue the additional fee. Apparently they don’t, or we would be seeing more photographers credited for their work. Photographer Sheila Smart, who licenses some of her work through Alamy and previously through Getty, can only speculate as to why there’s no attribution, and couldn’t recall one instance where she was credited for a photograph. ‘In reality, Getty does not really give a stuff for its contributors, as they are just a commodity. One of the reasons I quit Getty almost three years ago was their lack of any sort of empathy with their photographers,’ she told Pro Counter. Smart doesn’t view Getty’s lack of attribution as the worst example of the company’s treatment of photographers, and is quick to point that Alamy, another stock photography agency, is no better. In Australia, Alamy has emerged as a fairly competitive stock agency. A spokesperson for Alamy pointed to the Terms and Conditions that subscribers licensing editorial work agree to, which states that ‘you must include the copyright / credit line “(Photographer’s or Agency’s name)/Alamy”, or any other copyright / credit line specified by Alamy’. The same 100 percent penalty fee applies to breaking this agreement, but it does state that just the agency’s name can be credited. 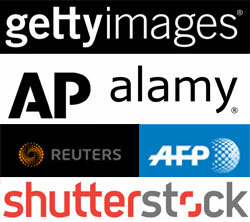 US-based Associated Press terms state that photo credits should include ‘visual representation of the “AP” logo on the photo, or immediately below, the words “Associated Press” and the photographer’s byline’. Again, most media outlets fail to attribute the photographer and thus break the agreement. Associated Press did not respond to Pro Counter’s request for a comment. 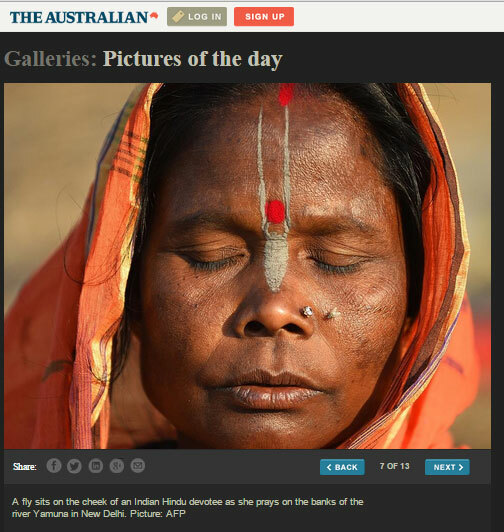 The Australian has an online gallery called ‘Pictures of the day’, which showcases powerful photography taken all over the world – by a photographer who goes by the initials of ‘AFP’! So it seems the agencies mentioned, and more than likely their competitors, don’t appear to enforce the rules that state photographers should be credited. Perhaps, as Sheila Smart suggests, the companies don’t care a great deal for their photographers. The 20 percent commission they pay does little to suggest otherwise. But then, why don’t the media outlets attribute the photographers? It’s not as if the photographer’s name isn’t staring the photo editor right in the face when they license the image. Is it some kind of passive-aggressive protest at the sorry state Fairfax and News Ltd photo departments find themselves in? Loyalty to their few remaining in-house shooters? The Media, Entertainment & Arts Alliance Code Of Ethics, as well as individual codes of ethics for each publication, state something along the lines of ‘sources of information must be identified’. There’s no real clear reason available to explain why media outlets choose to not attribute the agency and the photographer. There’s also no clear reason why the agencies don’t ensure their hard-working contributors are not credited. There’s only speculation, and that suggests that the agencies are far more concerned with keeping subscribers happy. Contributing photographers? Plenty more fish in the sea. Pro Counter asked for a comment from Fairfax and Newscorp, but did not receive a response at the time of publishing. This entry was posted in Business Issues, Deck left by Keith Shipton. Bookmark the permalink.